This twist bar is made for stretching the upper extremities to help reduce muscle soreness and joint pain. When recovering from elbow injuries or surgery, it can be nearly impossible to find the right tools with so many splints, bands, braces, and straps available. 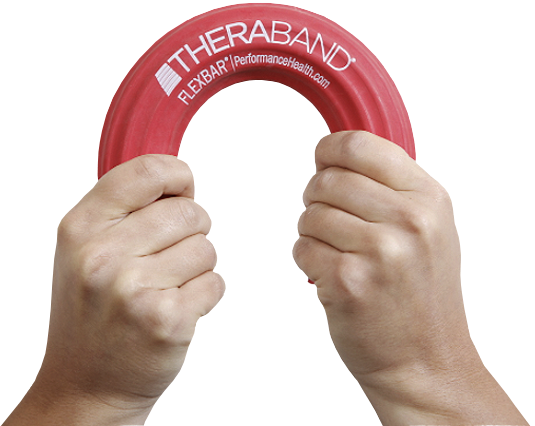 Stop trying remedies that won’t work and choose the TheraBand FlexBar, which is backed by clinical research, for your rehabilitation experience. 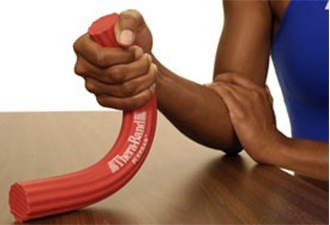 The TheraBand FlexBar can be used for forearm and grip strengthening exercises that tone and build muscles. Clinically proven to increase the strength of tendons by 72% for tennis elbow patients, this is the perfect hand grip trainer for recovering from epicondylitis and regaining full strength. FlexBars come in four resistance levels so there’s one for any workout need. The low resistances make great hand grippers and wrist strengtheners for hand grip training and wrist injury rehab. The upper levels are ideal for tennis elbow golfer’s elbow pain relief. The perfect tool for combating tennis elbow, golfer’s elbow, & tendonitis. TheraBand FlexBar is the perfect tool for combating tennis elbow, golfer's elbow, and tendonitis while providing improved hand strength and pain relief. The FlexBar is clinically proven to increase tendon strength and reduce elbow pain for those who suffer from tennis and golfer's elbow. 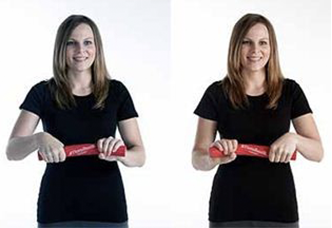 The FlexBar's rigid rubber design allows for various hand, arm, elbow and grip strengthening exercises. Whether you are a beginner with limited strength or at an advanced level needing more resistance, TheraBand FlexBar has a range of progressive resistance levels for your needs and goals. As your strength improves and you're in need of a greater challenge, advance to the next resistance level or increase your reps.
Takes 25 lbs of force to bend in U-shape. A simple rehabilitation exercise for tennis elbow sufferers. Follow these step by step instructions for pain relief with an easy twist of the wrist. Begin with the yellow FlexBar, and once you can easily perform the exercise advance to the next color of resistance for a greater challenge. Hold the FlexBar vertically in front of you, with your injured hand on the bottom end, and extend your wrist. Grasp the upper end of the bar with your other hand, facing your palm away from you. Twist the bar with the top hand as you stabilize with the bottom. Hold both wrists steady as you extend both elbows in front of you, turning the FlexBar horizontally. The wrist on your injured side should be extended and your other wrist flexed. Slowly release the bar with your injured side while maintaining tension with the uninjured side. Tyler Twist Exercise in action! The FlexBar isn't just for combating elbow tendonitis, Guitarists, rock climbers, fisherman, gymnasts, and many others can use the FlexBar to build hand strength and prevent injury. Begin with the yellow FlexBar, and once you can easily perform the exercise, advance to the next color of resistance for a greater challenge. Hold the FlexBar horizontally in front of you, with your injured hand on the bottom end of the bar. Reach over the top of the FlexBar with your other hand. Grab the bar and twist upward. Maintain the bar in a twisted state with both of your palms facing you. Hold both wrists steady as you extend both elbows in front of you. Maintain a flexed wrist with your injured arm. With both hands grasp the FlexBar, have your palms down and elbows out like you are about to wring-out a towel. To ensure a tight grip squeeze the FlexBar with both hands. Simultaneously perform a wringing motion - one of your hands moves away from your body as the other one moves toward. Hold 2-3 seconds. Slowly return to starting position (neutral). Repeat. Grasp one end of the FlexBar with the hand of the wrist to be exercised. Place that same bent elbow on a table, with the other end of the FlexBar resting on the table, approximately one foot away from your elbow. Place the non-exercising hand on your bent elbow for stabilization. Keeping your forearm stationary, slowly push against FlexBar to bend your hand down towards table. Move your hand towards the 'pinkie side' to exercise the muscles responsible for ulnar deviation.